At the October Land Use meeting James from McKenzie Architecture presented plans for a new development next to the Graham Street Lofts on the corner of NE Graham and MLK. 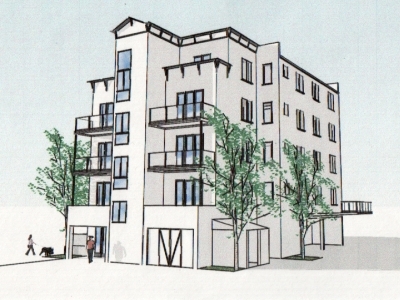 The new building will be 5 stories high with 14 units, either condo or rental, all under 1000 square feet. As with the Graham Street Lofts there will be about 1 parking space for every 2 units. Construction is scheduled to begin in the spring or summer shortly after the Graham Street Lofts building is complete. The construction method will use a similar concrete/foam material so construction time is expected to take about as long. In addition to the two McKenzie Architecture projects, west one block there are three more projects. The ever-changing Blueberry Lane at 65 NE Graham on the north side will be adding several houses. On the South side development is planned on two flag lots at 56 and 58 Graham, behind a pair of houses and 1 or 2 more houses are scheduled to be built on “flag” lots near 28 Graham.